The most capped England footballer of all time, goalie par excellence Peter Shilton OBE (and Strictly Come Dancing alum) brings his vast soccer experience to bear on sportswear now, with his endorsed Peter Shilton Pro Action Football Socks. 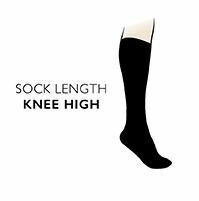 The classic styled knee high football socks are made to be extra soft, with a high amount of stretch and flex for playing fields sports, especially football, rugby and hockey. Peter Shilton Pro Action Football Socks have a fine to medium knit, extra long turnover top and a ribbed leg for better fit.